The work in collaboration with Nicol Wheatley took a year and a half to complete. 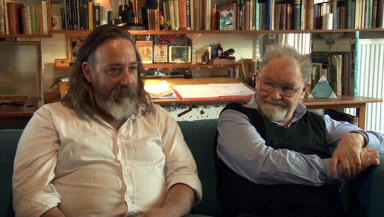 A mosaic by artist and writer Alasdair Gray has been unveiled at Glasgow's Western Baths. 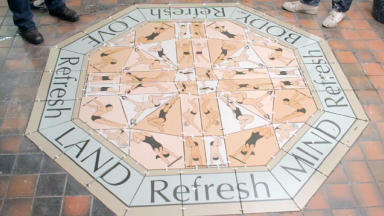 The 7ft octagonal design is based on the club's 137-year history and bears the slogan: "Refresh Mind, Refresh Body, Refresh Land and Refresh Love." The £10,000 work of art was commissioned by honorary secretary of the Western Baths, Bill Mann and took Mr Gray a year and a half to complete. The 78-year-old author and illustrator of Lanark has never learned to swim, but was offered a free membership if he agreed to be artist in residence. He collaborated with fellow artist Nichol Wheatley to produce the distinctive piece of work. He said: "I thought that since I designed a mural in tiles for a wall in the Hillhead underground and since my friend Nichol Wheatley - who had helped me turn my designs into tiles - was a member of this bath club too, I thought that he and I could put a design down that would be suitable."